This is one of the most popular Buckler shields. The Wooden Fleur De Lis Buckler Shield features an ornate fleur de lis reminiscent of the late Renaissance. The shield itself is made out of a smooth composite wood which is slightly stronger than plywood. Stainless steel studs line the border, and a single leather strap is secured to the back to be gripped with one hand. This highly maneuverable shield measures about 12 inches in diameter. 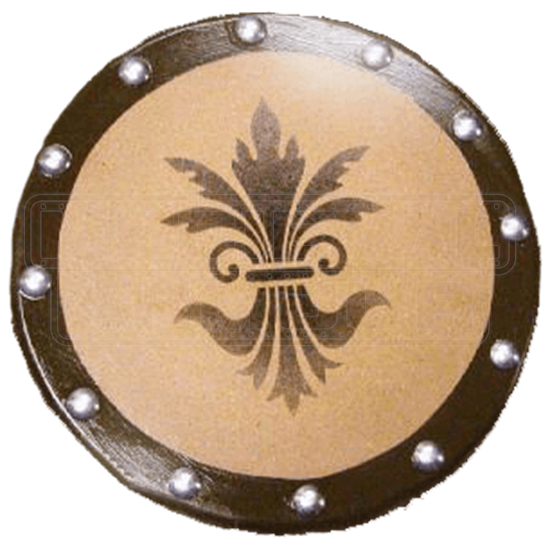 The Wooden Fleur De Lis Buckler Shield has several coats of topcoat finish have also been applied to protect the design from wear. This would be perfect for that upcoming Renaissance Festival in your area or some backyard brawling between friends. 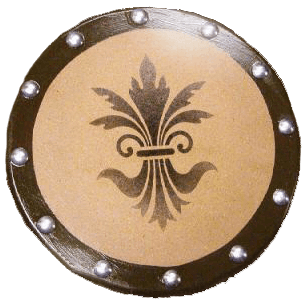 The Wooden Fleur De Lis Buckler Shield would be perfect for upcoming Renaissance fairs, LARP events, or medieval re-enactments. This wooden shield would also make a great gift for that Renaissance enthusiast for someone you know.